We found a few affected plants here at the Marsh, but quickly pulled them. I think we will be fortunate and not have any significant effects. Having planted over 200 tomato plants - with the removals, we are down to about 190ish. 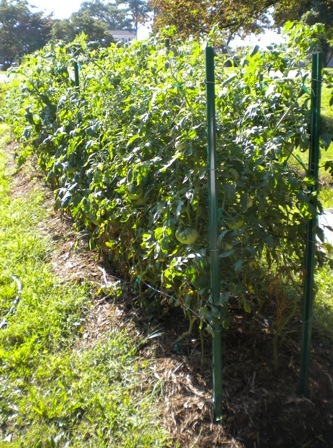 Of those about 90% are producing well and we have been eating fresh 'maters in our nightly salads since the end of June. Shari (the flower gardener) loves NOT buying tomatoes at the store! We planted a couple of pumpkin plants - so we'd have a few decorations for the fall season. 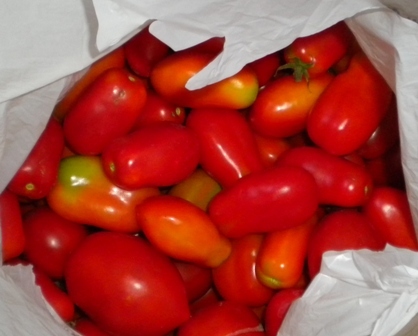 One of the local greenhouses introduced us to a variety of tomato that ripens "white". 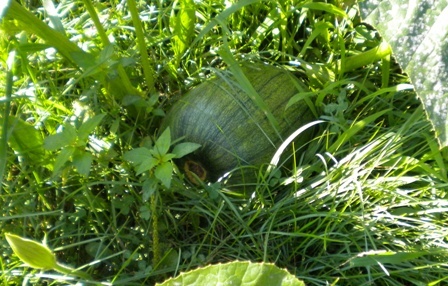 It is considered very low acid and it is large (over 2 lbs usually) and very tasty. There are also "yellow" varieties that we have planted - but the White is quite different - so we always make sure to put in 6-10 plants. Squash is good. 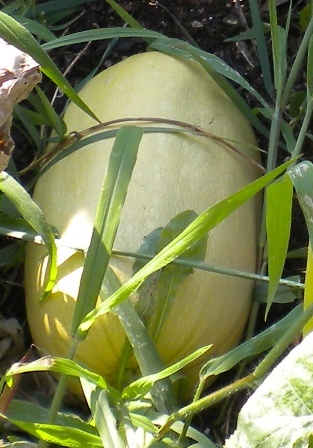 Spaghetti squash is well worth growing - and of course eating. Cut it open to find what looks like string Spaghetti. Yep. And you should use it as a replacement. Dribble tomato sauce on it, or butter, or cheese. It's great! The first pick in quantity of any tomatoes that have reached the ripe stage presents a scattering of many of the varieties planted. The various red, the interesting Green Stripey (green/yellow stripes), pinks, Black Krim (red bottom, dark green shoulder). Not huge in weight - but it gets the harvest season going. This load resulted in 2 nearly full gallon bags. Not a lot - but a start. We always separate out the Roma's. 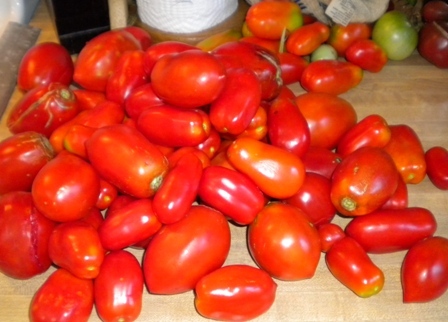 Roma tomatoes are used to make "tomato paste". They aren't as "juicy" - and in fact are more "meaty". This year I planted two varieties - an Amish Roma - which is the smaller tomatoes in the picture, and a larger variety which are about 2 or 3 times the size of the Amish versions. I was actually surprised at how big they are. Second step - separate out truly ripe, pick any stems off, and pile on counter for blanching. Blanching is the process of dumping the tomatoes into boiling water to "crack the skins" so we can peel off the skins and "bag up" for freezing. 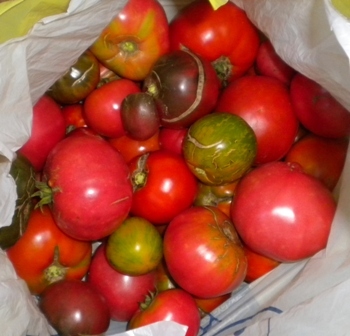 This load resulted in 3 quarts of Romas. Now that the harvest has started - we will pick every 5-7 days, but this will ramp up near the end of the month to every 3 days. Figure 20 lbs a pick early, but moving to 50-60 lbs a pick. Then about 1-2 hours of blanching & packing up. It's all worth it - every time we cook chili, spaghetti sauce, lasagna, or our Friday night Mexican nachos with garden salsa.... yummm yummm. This year our area has experienced significant rain - especially in June. July we had about 20 days of no rain. And so far in August, we have had some great storms. All of this has led to much less work for this garden than I expected. Since planting, I've had about 6-8 hours of weeding & mulching, about 8 hours of pruning & tying the plants to the guide wires, and probably a total of 8-10 hours of watering - which I do by hand in 30-45 minute batches. This enables me to keep an eye on the plants, pick errant unwanted plants (volunteers of any type... e.g. weeds). So let's say a day of "care" over 2.5 months. Not bad and much less than many people think.